An excellent hostel, one of the best I've ever stayed at. Clean, quiet, comfortable, reasonably priced, and located near the center of the city. Top-rate breakfast every morning. The rooftop terrace is spacious with a fantastic view of the city. The staff gets all my love. The girl at the desk was super nice and gave me an in-depth rundown of what to do in the city and where to go next. Claas, the manager, is extremely generous and will go out of his way to help you with whatever you need. Amazing rooftop atmosphere. Very clean kitchen and bathroom. Claas is an amazing host, offered us his homemade rakija and he has a really nice conversation. 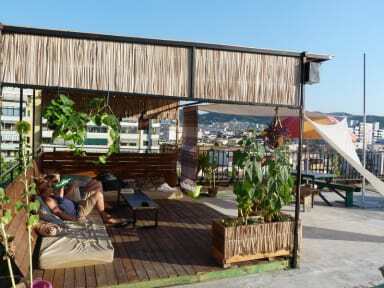 Excellent hostel - especially the breakfast, and rooftop hammocks! Staff were friendly and very helpful. There are plenty of facilities to use, the roof terrace is amazing and views of sunset are so cool. Beds are very comfortable and the free breakfast is filling. Be prepared for a walk up a fair few steps though as they are on the top floor of the building but I promise it is worth it. Thankyou Homestel we would most definitely return. The perfect place . ! The only thing is on the 5th floor with no elevator .. The owner and staff here are really friendly and helpful (although be warned, there is a lot of stairs up to the apartment! ;-) ). Great roof terrace (Claus you need to check your dl's ;-) ). Definitely would recommend for a quiet few days. Great hostel. Catered to my disability and gave me a bottom bunk. Great breakfast. Absolutely amazing hostel! The owner is super helpful willing to go the extra mile super understanding. He invited me and a group of others out to have a fun night with good music! We all planned a date to come back next and am looking forward to it!